Intimate don’t you think? I wonder if she got what she wanted. People do like to leave instructions about how they wish their remains to be disposed of. Often there are several places for ashes. Whole body buriels are simple. Both my parents, their bodies, lay beneth the earth, side by side, at Throssel. They wouldn’t have wanted it any other way. More memories: One memorable day in 2011 I chugged up a railway line in the engine of a steam train clutching a very small portion of cremated remains. The driver opened the fire box and in went the ashes, and with a prolonged blast on the ‘hooter’ the late Iain Robinson met his final glory. He wouldn’t have wanted it any other way. Again, an intimate occasion with his widow there to witness. Yes we pay our last respects and honour last wishes. It is their lived lives that live on. I’m sitting as the sun rises over the horizon. There liquid the sea between Canada and America. Further the rocky Olympic Mountain range in Washington State. 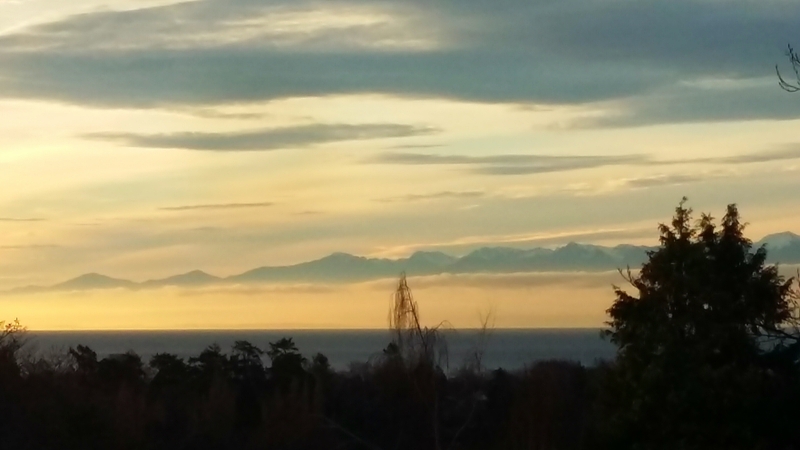 High up on the top floor of a Victorian house in Victoria (Vancouver Island) I can see for miles and miles. Expansive, and inspiring in a particular kind of way. I’ve been thinking of life and death. Viewing death, a newly dead body, there seems to be life. Was that a ripple of a breath? Did the eyes flicker, a little. (The sea glass-still is alive.) And the liveliness radiates; a joyful illumination. People notice that about dead bodies. There is joy present. Rev. Master Meiten, recenty passed here in Victoria, I was at her Cremation on Tuesday. Though gone days before from her shell there was a certain ‘life’ or light. A kind of vibration perhaps, was present in the stillness. Best I can say. What’s in a view? What is it that comes through our eyes and registers in our brains? Mountains and water? A seeming dead person. Completely solid only? Liquid light, vibrational only? I’m contemplating lines from the Heart Sutra – ‘form is only pure (empty), pure is all form’….’for what is form is pure and what is pure is form’. What’s in a view, any view, close or distant? Could it be that we are looking into a mirror reflecting back to each of us our liquid light, taken form. Here and gone, being and non being. Simultaneously! Just sitting we ‘know’, we ARE this!. And just sometimes that truth comes in a flash atop a mountain, or looking through a microscope. Expansive and inspiring in a certain kind of way. That Truth though is ever entering each of us. It just seems we have to stop and view. A wall is as good a view as any. This post is for Rev. 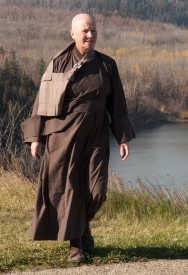 Master Meiten and the Sangha she served here in Victoria and around the world through her writings. "Out beyond ideas of wrongdoing and rightdoing there is a field. I’ll meet you there. When the soul lies down in that grass the world is too full to talk about. Here is Harley, rescue dog, German Shephard Collie cross. Her person works at an outdoor store in down town Victoria, Canada. 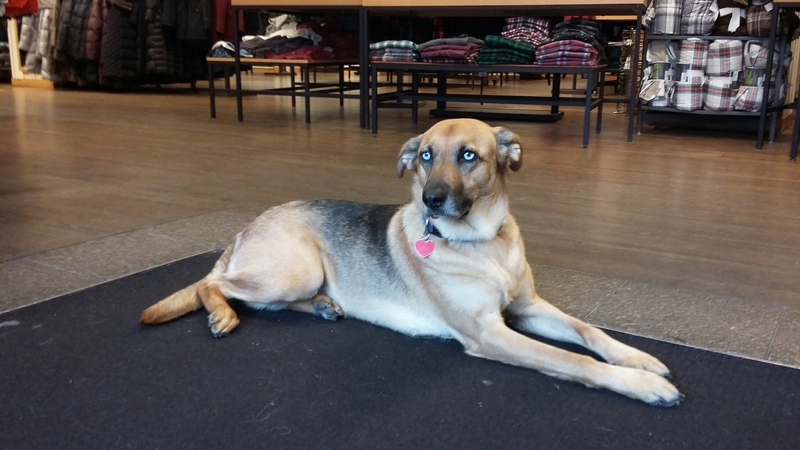 Harley greets customers. The Light certainly entered her and she is giving it away freely.